Opened at the present location in the year 2011, the Calgary’s Farmers Market is a beautiful concept. This family friendly market is a dynamic place of community engagement. Boasting of a footfall of over 20,000 people per week, the market houses 80 vendors, supplying customers with fresh local produce, art, meat, poultry, international food, organic goods, jewellery and a lot more. How popular is Calgarys Farmers Market? People normally club together The Military Museums and Heritage Park Historical Village while planning their visit to Calgarys Farmers Market. Pricey, good looking and organized. Lots of good produce; however, you have to know a lot is not local, even in the summer. Some really good local produce and products as well like the honey, Beck's carrots, comes from local suppliers and is well priced. Careful though, the Market is alluring because its called 'Farmers', but that is just a name. It is trendy and pricey. 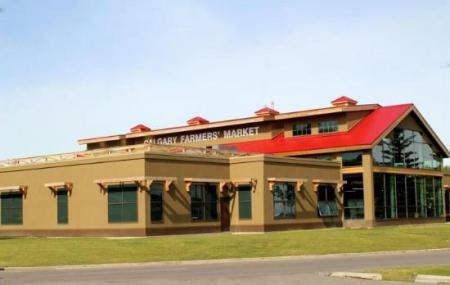 This is a great Farmers Market in South Calgary. It has a wide variety of local booths that sell anything from Artisan crafts to local organic foods. It has many restaurant kiosks that you can order well made fast food from, with a reasonably large seating area. There is a kid's play place, and it is a great place to bring kids in general. It is a little bit on the expensive side as a whole, but that is to be expected with locally made products. The vendors are very friendly and they create a family atmosphere. Just visited the market today. It was my first time there and to be honest I wasn’t impressed. Don’t get me wrong, it’s a good market, but I was expecting more of fresh vegetables, fruits, and berries. There are a lot of places to grab a bite, however being on a very strict diet (gluten-free, dairy-free, nut-free) it was really hard for me to find something. There was one place that had buckwheat (gluten-free) crepes, but the fillings were not for me. Also there was a gluten-free bakery, but I found most of their product non-appealing. Overall, fun family experience, but I wouldn’t go there every weekend to shop. I love this farmers market. It is upper scale and everyone is so nice and friendly. They have lots of samples available if you want to purchase anything. It is never crazy busy so you're not bumping into people constantly. It is very clean and upscale as I said. A great sized Farmer’s market in the south that sells a wide range of edibles and non-edibles, supporting both locals and Canadians. They have several fruit markets, meat shops, crafts, desserts, gifts, a flower shop, etc. Their food court also offers a selection of healthy and delicious foods! Basically, it’s a one stop shop for everything healthy, fresh, and one-of-a-kind. It’s definitely one of my favorite place to walk around with a coffee in hand!